Here’s the deal with Project 2. It’s not like anything we’ve done before in Toastmasters. You’re given 3 tasks in one project, which, in my mind, is confusing. That’s not how I would write a checklist item. I think this is what’s tripping people up on this project. For me, a checklist item doesn’t start with what you’re to do in the project, it starts with the project name and adds the details. But that’s just me. But is it? This level of confusion in so many people makes me think that I’m not the only one who needed someone to explain this project in detail to me. 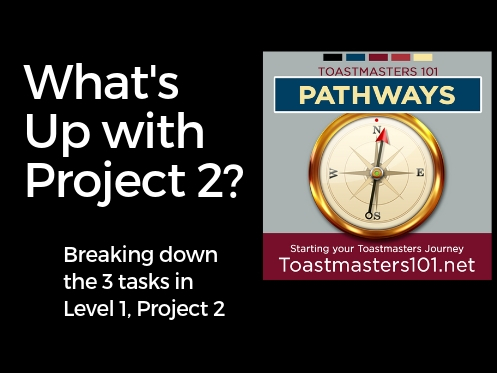 After you complete your Ice Breaker speech, you have to go back to the Pathways project and complete the post test – we covered that in episode 6 – Don’t Forget Your Post-Test . Once your club’s base camp manager confirms your work on Pathways, you can open the Project 2 instructions. Again, this requires a pop-up window, so look for it behind your browser and maximize it. The first task is to present another speech – different from your Ice Breaker. Pick whatever topic you want, but I suggest you pick one that you’re really interested in because you’re going to do this speech twice. The training on the Pathways Base Camp will give you a lot of good information on how to get and give evaluations, but not so much about how to write a speech. So let me give you a couple of quick thoughts before you start to write the speech. First, try to pick a topic that’s not very emotional for you. Think of it as an informational speech. Educate us. Second, pick three things about that topic that we should know. Suppose you’re going to talk about cats. You can guess that several members of the club know or own a cat. But you probably have some good cat stories of your own, so plan to share at least one. Third, take some time after you’re done writing by reading your speech aloud and thinking about what you want the Toastmaster of the Day to say about you and your speech before you speak. I don’t know why, but that’s when I often get my best ideas for my speech – to the point that I might change the speech’s title or change some of the content. Weird, right? When you give your speech, your evaluator will need the evaluation form you must provide. We’ll talk more about the evaluations in the next podcast, but for now, this piece of paper is crucial because you’re going to take the content of the evaluation – verbal and written – and use it to rework this speech. The purpose of the double speech project is to help you. You’re going to hear some points of growth from your evaluator. If you’re in Toastmasters, you’re probably here because you know you’re not a perfect speaker. You should be open to hearing and acting on the feedback you’re given. I hope that your evaluator is kind and not mean and it’s easy to accept what they have to say to you. Take that advice and apply it to your speech and modify it to improve it. Or listen to their suggestions about your speech presentation skills. You’re going to repeat your speech, improved. Make sure you can get the same evaluator for the 2nd speech. Sometimes that’s not possible, so bring your first speech’s evaluation with you so this evaluator will know what was suggested. Honestly, if I’m your evaluator for both speeches, bring the evaluation anyway. I need the refresher. Now it’s time for you to evaluate someone else. We’ll be talking about that in a future episode. Since we’re just reviewing the Project 2 tasks, you’ll have time to listen to that podcast in the future. That’s it. Project 2 in about 800 words. Three tasks, but the entire project is going to take at least 3 weeks. At the end of that, you’ll be 80% done with Level 1!